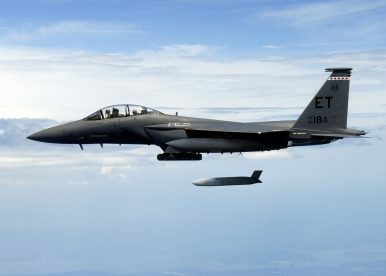 Lockheed Martin’s subsonic, turbofan-powered AGM-158B Joint Air-to-Surface Standoff Missile – Extended Range (JASSM-ER) cruise missile has achieved full operational capability (FOC) on the Boeing F-15E Strike Eagle multirole strike fighter, according to a February 8 company statement. The U.S. Air Force (USAF) had already declared FOC for the new weapon system on the F-15E in late 2017; however, this was only publicly revealed this month, IHS Jane’s Missiles & Rockets reports. The introduction of the new missile adds a significant boost to the U.S. military’s standoff air-to-surface strike capabilities. The integration of the missile on the new fighter jet was led by the U.S. Air Force Seek Eagle Office. The USAF currently operates 219 F-15E Strike Eagles. In comparison to the JASSM, the extended range variant has more than double the range. The USAF approved full-rate production of the JASSM in December 2014. The U.S. military plans to buy over 2,400 JASSMs and 2,978 JASSM-ERs. The cost per missile is around $1 million for the former and $1.75 million for the latter. Both the JASSM and JASSM-ER are long-range, radar-evading cruise missiles designed to destroy hostile air defenses and well-defended fixed and relocatable targets while keeping strike aircraft safely out of range from enemy air defense systems. The JASSM-ER is already integrated on the B-1B Lancer and is in the process of integration on the B-2 Spirit, B-52 Stratofortress, F-16 Falcon F/A-18E/F Super Hornet, and the F-35 Lightning II. The U.S. Navy has also been working on an anti-ship variant of the JASSM, designated Long-Range Anti-Ship Missile (LRASM), which will be available in air-launched and ship-launched variants. The LRASM was successfully test fired from a B-1B Lancer over Point Mugu Sea Range in California on December 12.